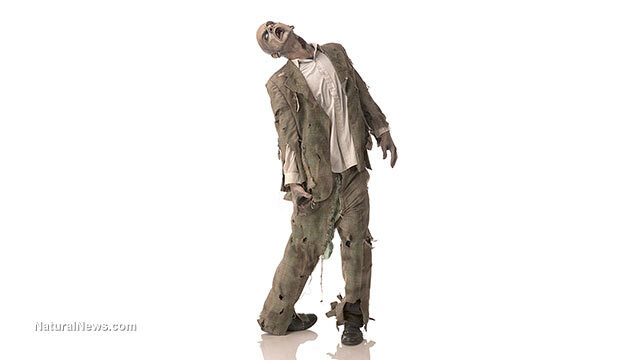 And in Washington, DC, the Centers for Disease Control and Prevention have put together a zombie apocalypse preparation kit "that details everything you would need to have on hand in the event the living dead showed up at your front door." The zombie narrative, popularized by the hit television series The Walking Dead, in which a small group of Americans attempt to survive in a zombie-ridden, post-apocalyptic world where they're not only fighting off flesh-eating ghouls but cannibalistic humans, plays to our fears and paranoia. Fear the Walking Dead—AMC's new spinoff of its popular Walking Dead series—drives this point home by dialing back the clock to when the zombie outbreak first appears and setting viewers down in the midst of societal unrest not unlike our own experiences of the past year ("a bunch of weird incidents, police protests, riots, and ... rapid social entropy"). Then, as Forbes reports, "the military showed up and we fast-forwarded into an ad hoc police state with no glimpse at what was happening in the world around our main cast of hapless survivors." Forbes found Fear's quick shift into a police state to be far-fetched, but anyone who has been paying attention in recent years knows that the groundwork has already been laid for the government—i.e., the military—to intervene and lock down the nation in the event of a national disaster. Recognizing this, the Atlantic notes: "The villains of [Fear the Walking Dead] aren't the zombies, who rarely appear, but the U.S. military, who sweep into an L.A. suburb to quarantine the survivors. Zombies are, after all, a recognizable threat—but Fear plumbs drama and horror from the betrayal by institutions designed to keep people safe." We've been so hounded in recent years with dire warnings about terrorist attacks, Ebola pandemics, economic collapse, environmental disasters, and militarized police that it's no wonder millions of Americans have turned to zombie fiction as a way to "envision how we and our own would thrive if everything went to hell and we lost all our societal supports." As Time magazine reporter James Poniewozik phrases it, the "apocalyptic drama lets us face the end of the world once a week and live." Here's the curious thing, however: while zombies may be the personification of our darkest fears, they embody the government's paranoia about the citizenry as potential threats that need to be monitored, tracked, surveilled, sequestered, deterred, vanquished and rendered impotent. Read the rest of the article at Rutherford.org.